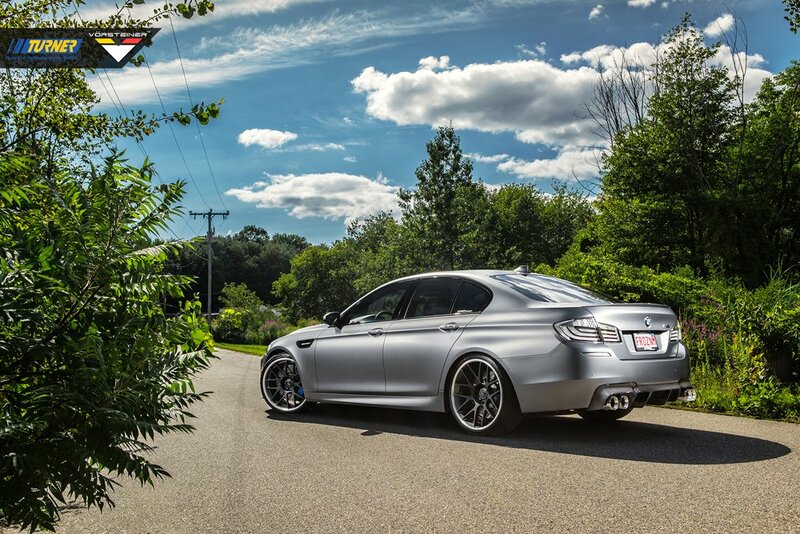 The M5 has always been a favorite amongst us here at Turner. 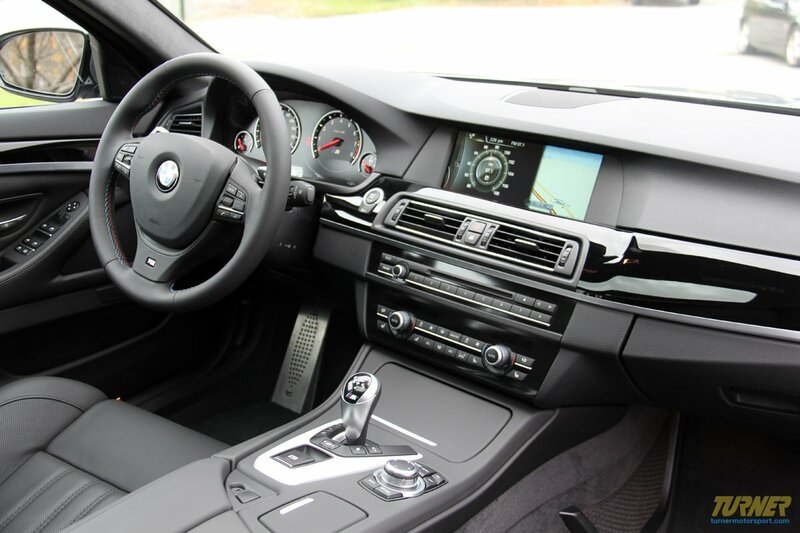 There is nothing quite like a super luxury sedan with huge amounts of power. The unassuming aesthetics and absurd performance figures combined with the latest technology and gadgets make this car the ultimate sleeper. To the untrained eye the M5 might just look like any other luxury sedan on the road today with its long wheelbase and bulky appearance. Aside from some subtle changes in the front and rear aero features of the car along with the M5 side grills and M5 wheels, the car does not look much different than any other F10 5-series, especially considering both the 550 and 535 are available with M sport packages which make them look almost identical to the M5 from the front. 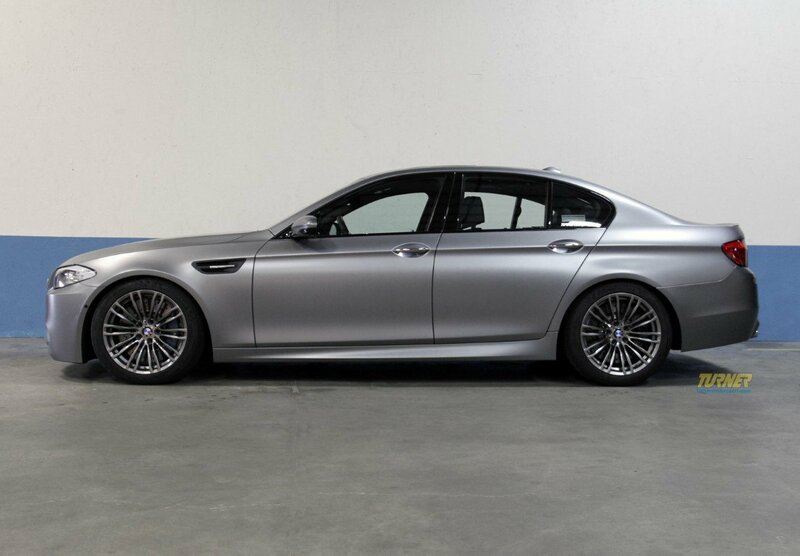 This latest M5 comes from a strong lineage of high performance super sedans which means it has an extremely high expectation to live up to. 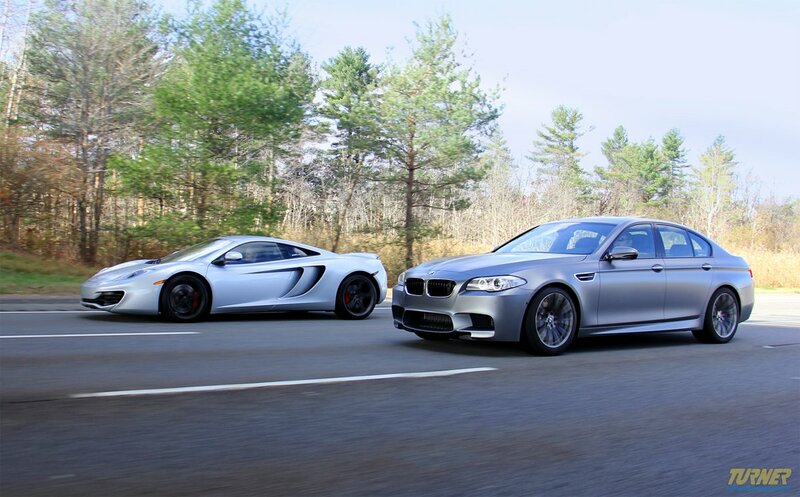 Both the E39 and E60 M5s produced huge amounts of power. The E39's 5.0 liter V8 made amazing torque throughout the entire power band making it a blast to drive while making the life of the OE clutch very short. The E60 had a very different type of power, the kind of power that is only really utilized on the racetrack or the autobahn. There is nothing quite like that S85 V10 revving at 8000 rpm. This latest M5 comes with the S63TU which is a twin turbo 4.4 liter V8 producing 560 HP and just over 500 ft-lbs of torque edging out the E60 by 60 horsepower and 116 ft-lbs of torque. 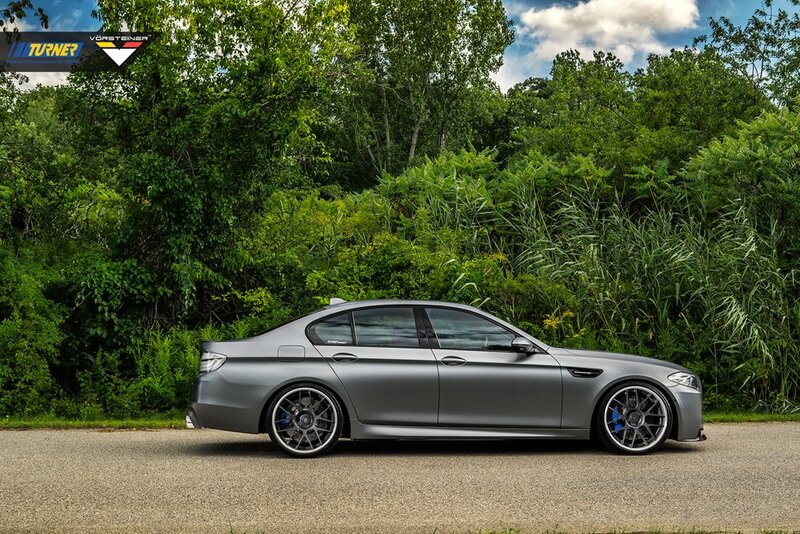 In addition to the added power, there is some added weight as well; the F10 M5 is just under 200 lbs heavier than its predecessor. Yes 200 lbs is a considerable amount of weight and yes the newest M5 is a bit longer and wider but when you get behind the wheel and put the car is sport+ the added weight and size is hardly noticeable. Once you get behind the wheel and dip into the throttle the instant torque throws you back in your seat and the weight and size of the car are distant memories. " I love the new M5, the car is so smooth, comfortable, and fast! 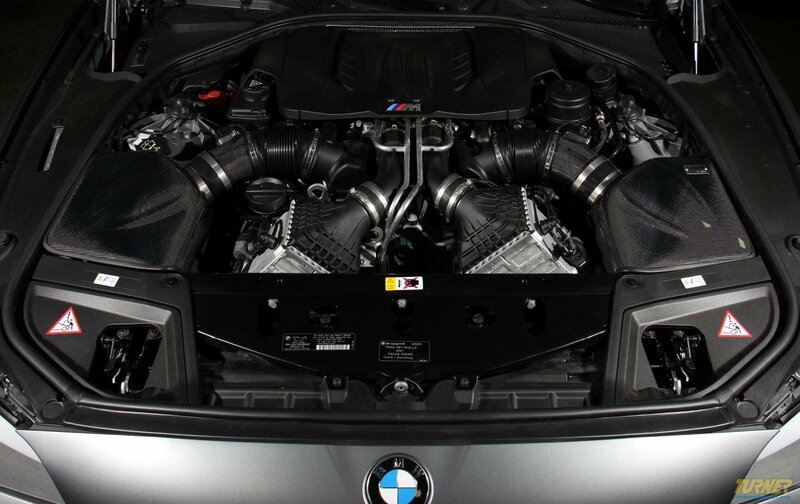 The power delivery of this twin turbo V8 in unbelievable. The torque is instant with absolutely no turbo lag." Said Will Turner. "It is the ultimate daily driver". Driving the car around Germany gives you a perspective on the car you would otherwise not have driving in the US. 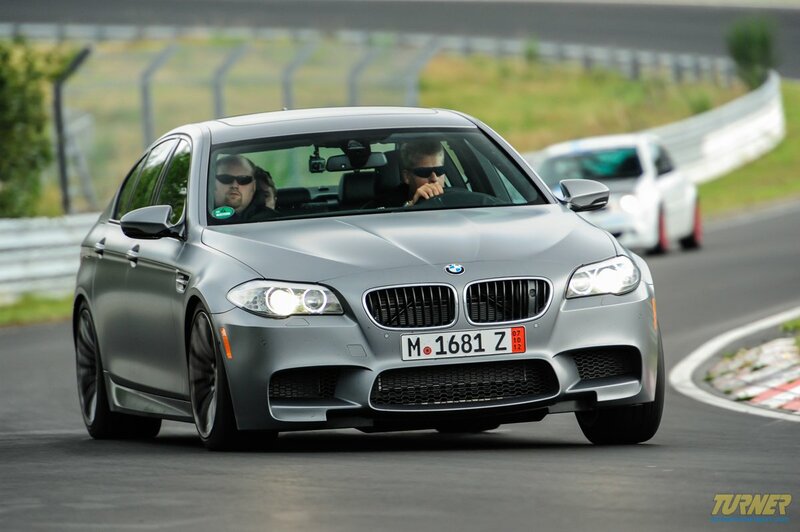 Driving the autobahn in the new M5 demonstrates the need for some of the new features available in these cars. For example, the frontal collision avoidance, lane departure features as well as the blind spot monitoring and heads up display with speed limit info are extremely important when traveling at high rates of speed for long durations. 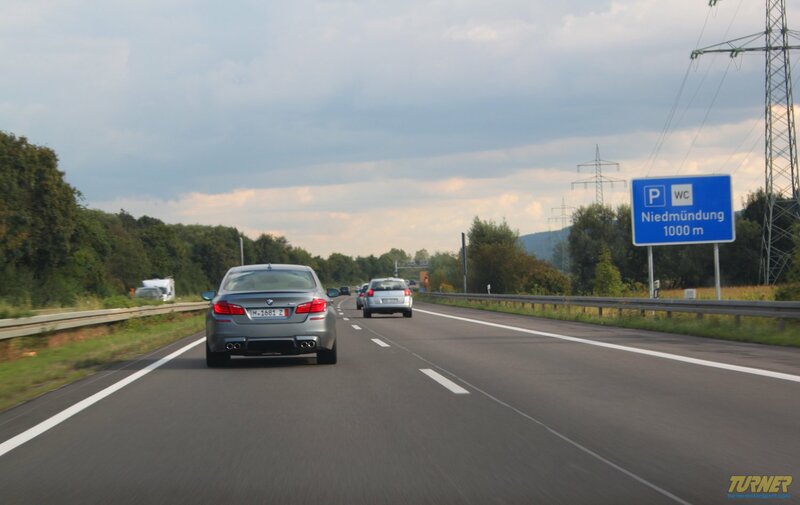 During a few of our longer drives down the Autobahn, from the Nurburgring to Munich in particular it was obvious how helpful these features really are. Another feature that became extremely useful in some of the compact cities of Germany was the parking assist and cameras. Since this M5 is both longer and wider than previous generations it proves to be somewhat difficult to park in some situations. This is where the new and improved park assist and "top down" view is extremely useful. The cameras positioned under each side view mirror, in the trunk and on the top of the windshield allow you to park the car in very tight positions with pinpoint accuracy. Night vision was also another interesting feature that was surprisingly useful in several situations. When navigating the tight back streets of cities such as Heidelberg and Cologne the night vision with pedestrian detection became very useful in alerting us if a pedestrian was crossing the street up to 980 feet ahead. The system alerts the driver as soon as a detected pedestrian moves toward the road. On paper these features and options seem a bit superfluous but when put to use in the real world they prove their practical use in many situations. Using these features through our time in Germany gave us a new appreciation for these features that may not be so crucial here in the US. 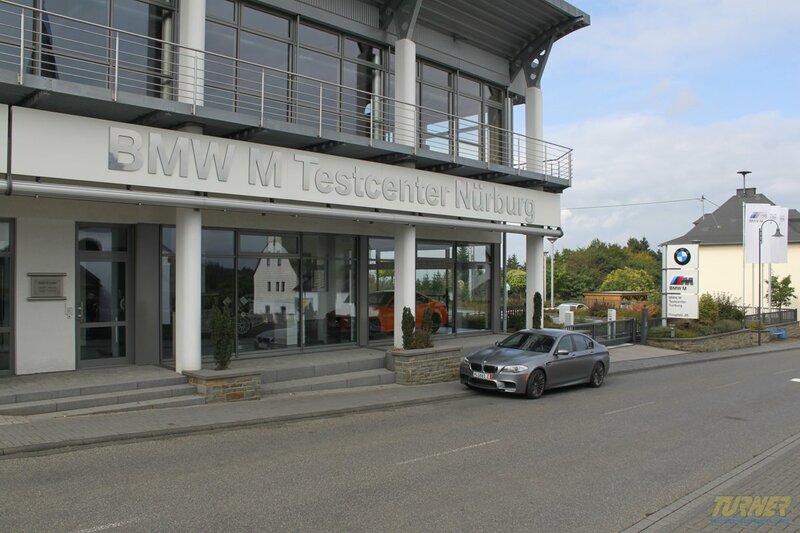 At Turner we pride ourselves on being on the cutting edge of performance and technology for BMWs. 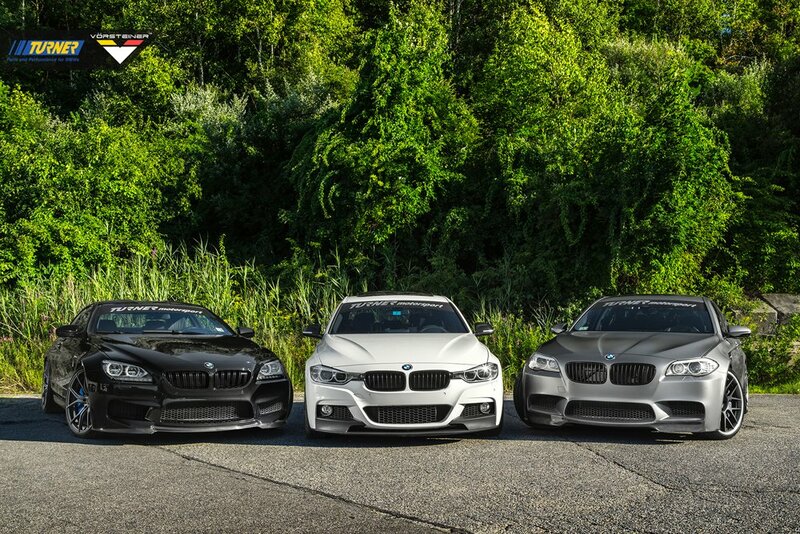 We want to have a complete understanding of these new cars to secure our future as a leading BMW tuner. 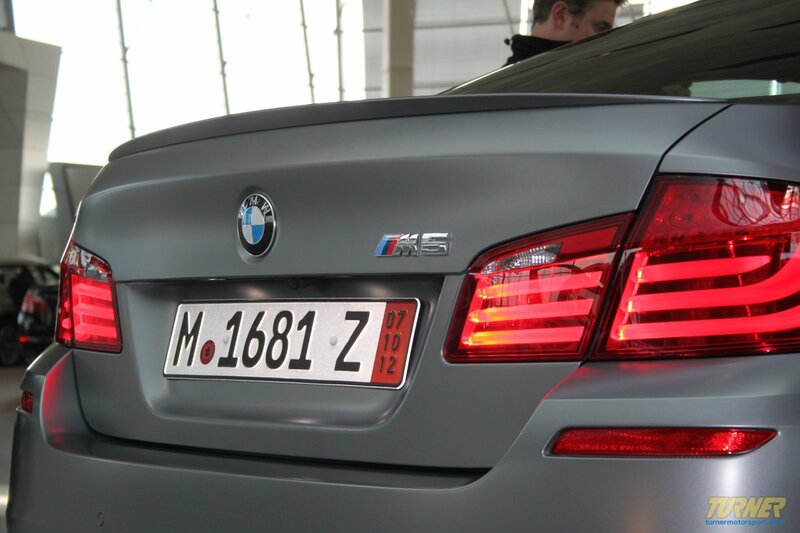 Please stay tuned for more to come on the new M5. Our goal is to take this fifth generation M5 and make it unique. We are going to hand pick the best possible products and accessories for this project car to learn first hand the true potential of this latest generation of forced induction BMW power plants. 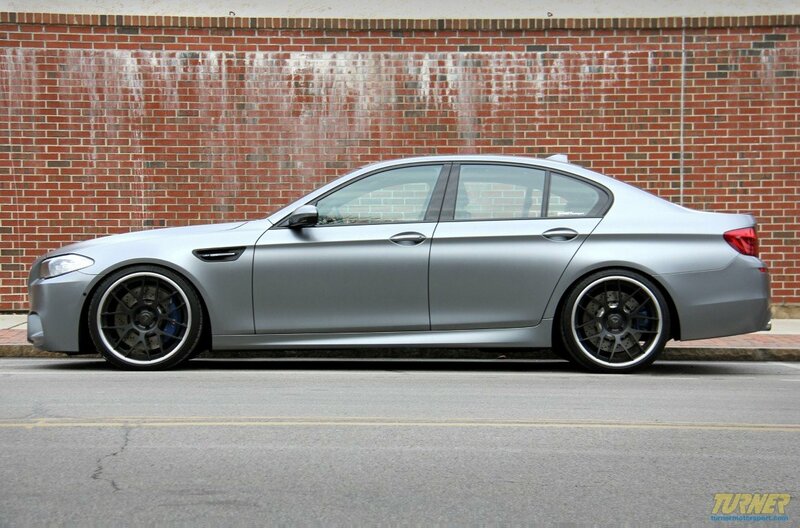 Please stay tuned as we begin to modify this M5 and review the products we use. 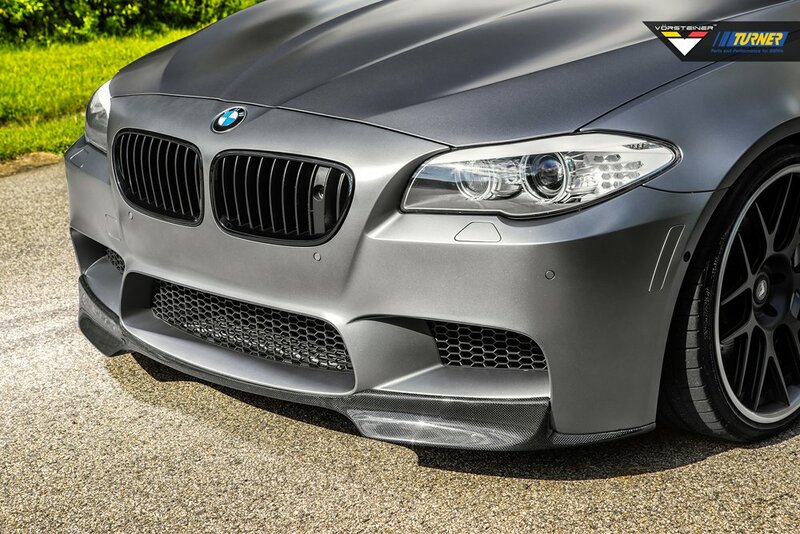 The Gruppe M Intake for F10 M5 fitment is very good. The install takes approximately 2-3 hours depending on skill level, this includes the removal of the front bumper. We followed the instructions which were good but were sometimes hard to follow due to the translation from Japanese to English. We began the install by removing the front bumper of our M5, this was relatively easy. The most difficult part of removing the front bumper on our particular car was the connections to the night vision. There are power supply and video cables as well as a washer fluid hose that connect directly to the back of the camera inside the driverÂs side kidney grill. The night vision camera actually has a washer jet on the lens to keep it clear just like the headlights which we thought was pretty cool, something you donÂt think about. After we removed the washer fluid hose and capped it off the bumper was removed and we could access the area behind the grills to install the ram air scoops which collect air flowing through the grills and forces it into the air intake inlets behind the headlights. The install of these scoops was simple. After the scoops were installed we continued on to remove the stock air boxes and stock mass air flow sensors to switch them over to the new Gruppe M intake piping. The fitment was great and there were no issues with installing the OE Bosch sensors into the Gruppe M piping. 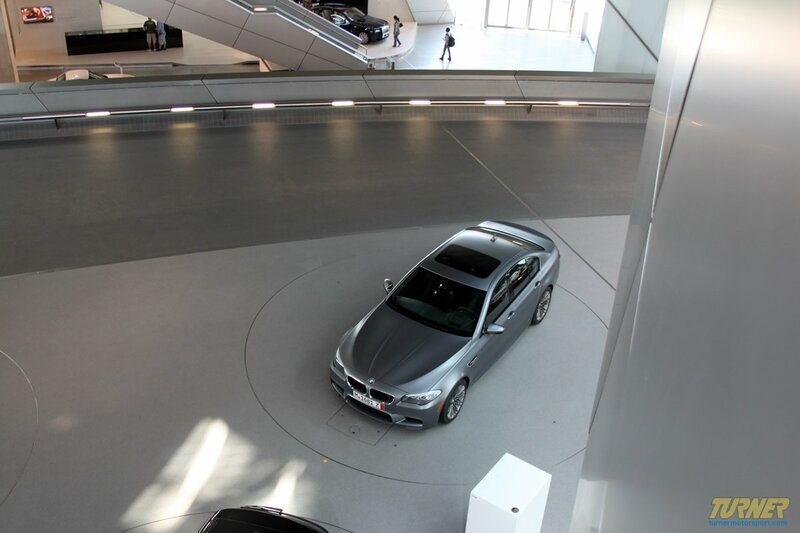 As we began to install each Gruppe M piece we had absolutely no fitment issues at all. Everything lines up as it should. All the hardware needed to install the kit is provided, including the hose clamps, screws, and bolts. We are extremely happy with the install of this intake. The directions were as clear as they could be with the needed translation, each component of the Gruppe M intake was flawless both aesthetically and functionally. Each part fit perfectly, as if it was original equipment. The one thing we would improve is to make the photos in the instructions a bit bigger. Other than that minor complaint we would recommend this product for any M5 owner looking for a high end intake that looks great and fits great. The carbon scoops behind the front grills look awesome as well as the carbon air boxes and intake tubes under the hood. 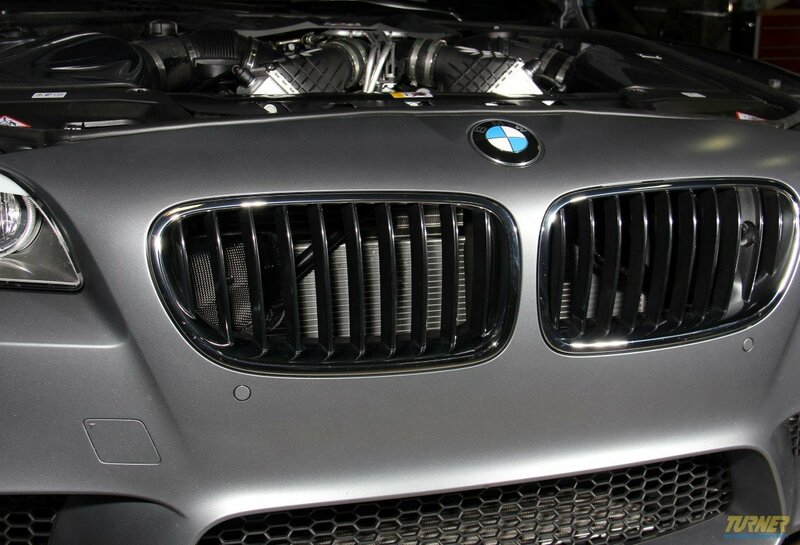 The high quality look of the carbon fiber really compliments our M5, improving the look of the engine compartment. 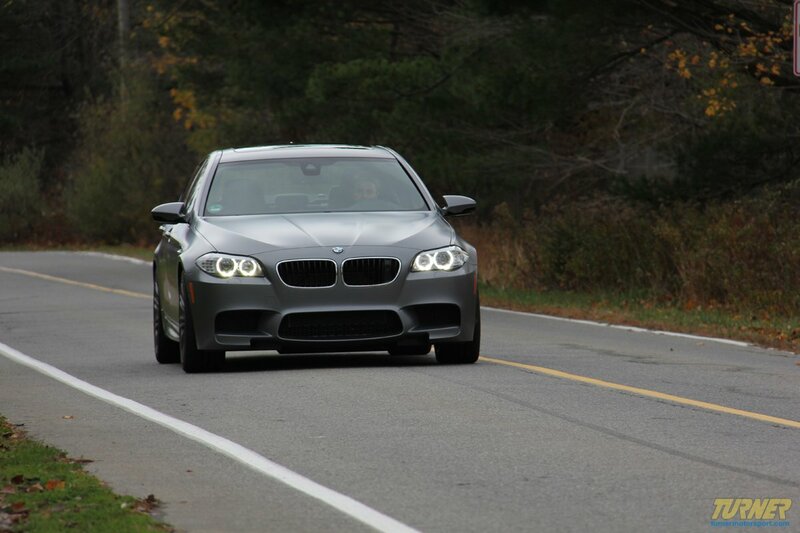 Stay tuned to hear our first impressions of the intake as we put some miles on our M5. 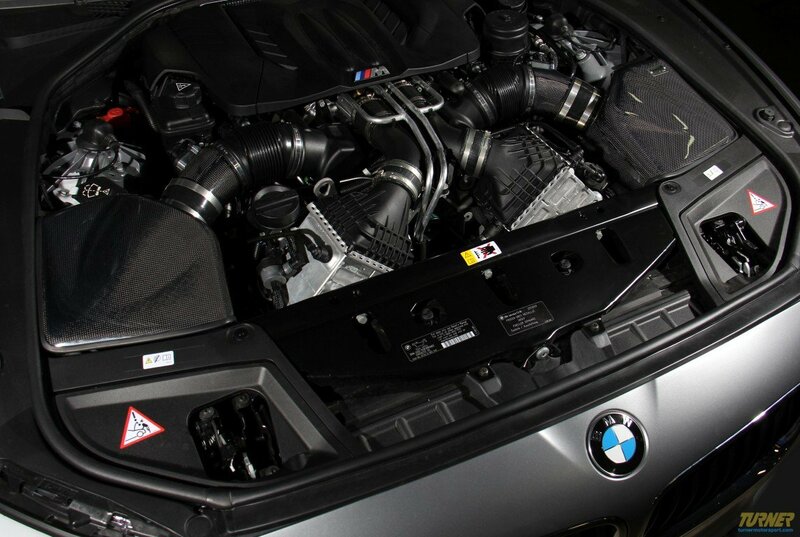 This mass air intake system is designed to harness the maximum amount of air available in the F10 M5 engine bay. Careful testing went into the production of this Carbon Fiber system. The air is directed from the rear of the front grill directly into the intake manifold. 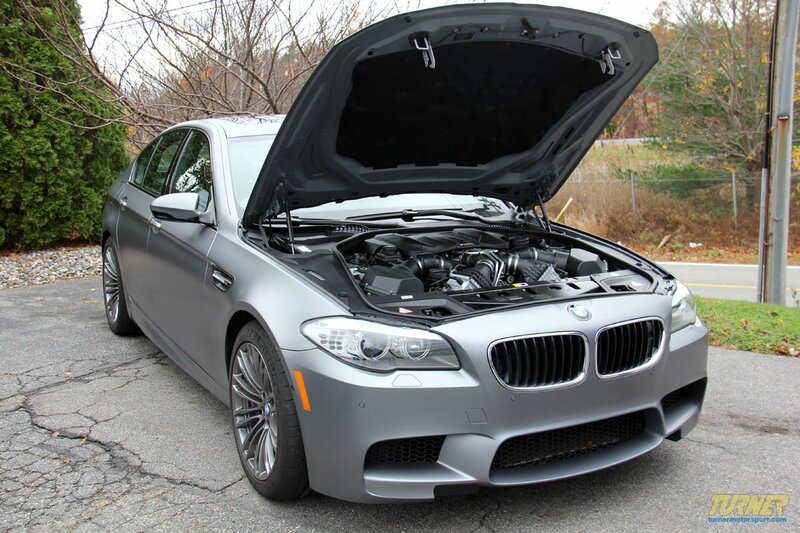 The air flow is greatly increased within the 4,000-5,500rpm range where the M5 makes the most power adding approximately 15hp and 30 ft lbs of torque. Stay tuned for our first impressions of this intake kit as we put some more miles on the M5. 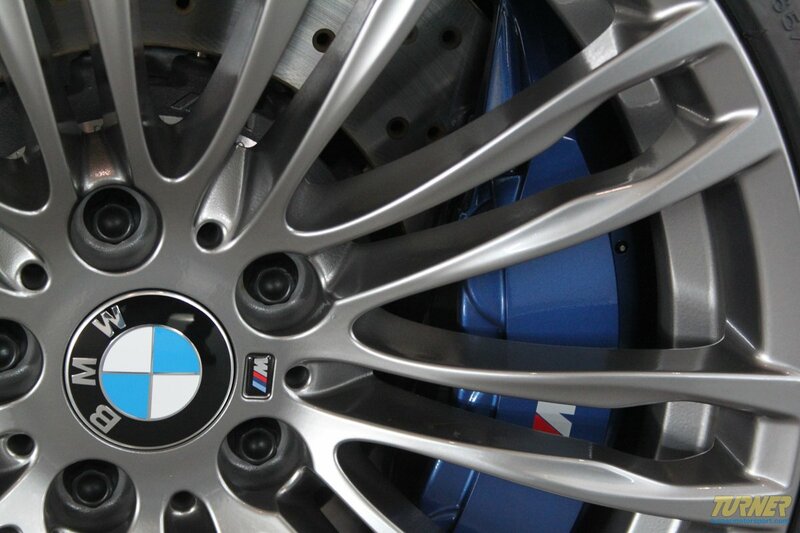 We installed the H&R Sport Springs on our F10 M5. H&R springs are designed to lower you vehicle to improve handling by lowering the center of gravity, thus decreasing body roll and weight transfer. They also reduce that annoying fender well gap on BMWs with stock suspension. Although the new M5 does come from the factory with a lowered ride height from other F10 5-series it still needed to be a bit lower. We were a bit hesitant to put springs in this car because of how good the stock ride comfort and handling was, the EDC system on this car is fantastic. That being said, H&R springs are the best out there and we knew they could only improve the car. 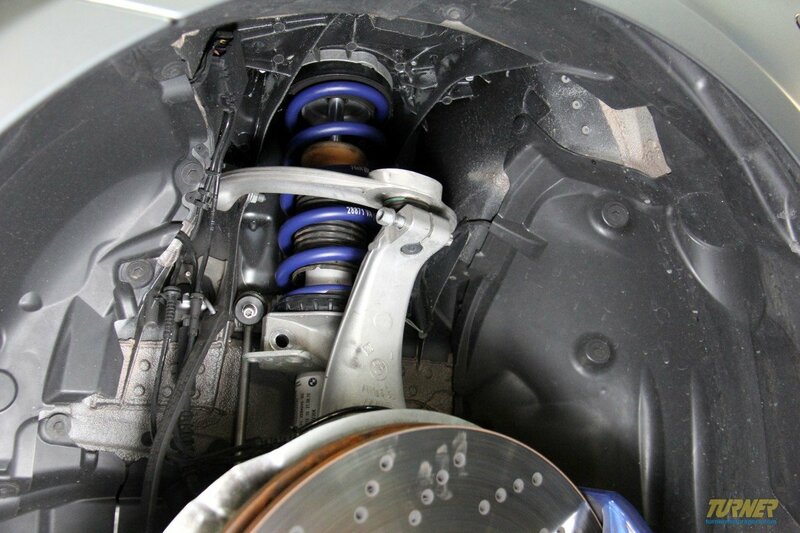 They are one of the first upgrades we perform on any of our project cars from our E92 M3 to our ActiveE Electric 1-series and X3. The install of these springs took approximately 6 hours. It involves removing all four coil over (spring and strut assemblies) from the vehicle. Each coil over plugs into the EDC system which makes the removal and install of the strut assemblies a bit tricky, especially in the rear where you need to access the top of the strut from under the rear deck tray. You must remove the rear speakers and some trim pieces to access the the EDC harness and the 3 bolts holding the strut. The most difficult and time consuming part of doing the spring install is making sure there is ample room to remove the rear strut assemblies without damaging the EDC harness on the strut its self or anything around it like the electronic emergency brake. We found the best way to do this is to disconnect the rear sway bar, remove the rear caliper with electronic emergency brake and disconnect the rear control arms. This gives plenty of room to pull out the coilover strut out of the rear wheel well. 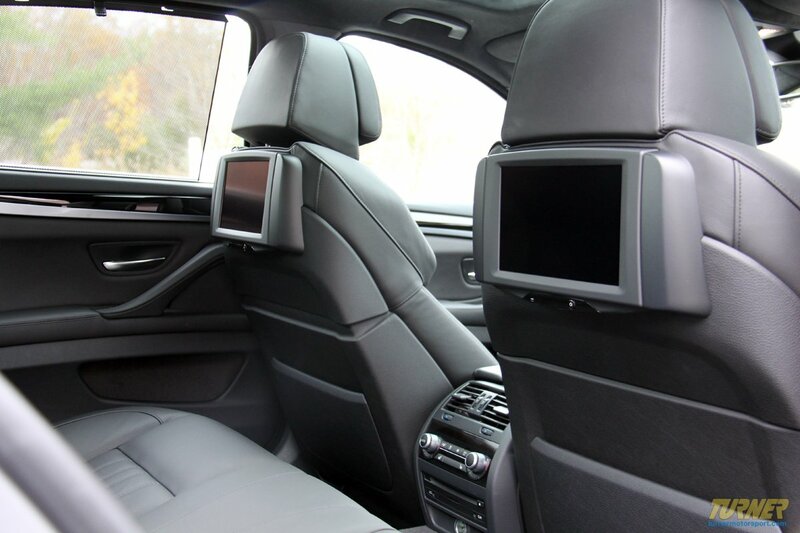 Other than that the install is relatively straight forward, the front is basically just like most other BMWs. The H&R springs lowered the car exactly 1 inch in the front and a little over Â½ inch in the rear giving the car a great stance with a small amount of rake. We love the look of the car with the H&R sport springs, just the right amount of lowering giving the car a bit more of an aggressive stance. 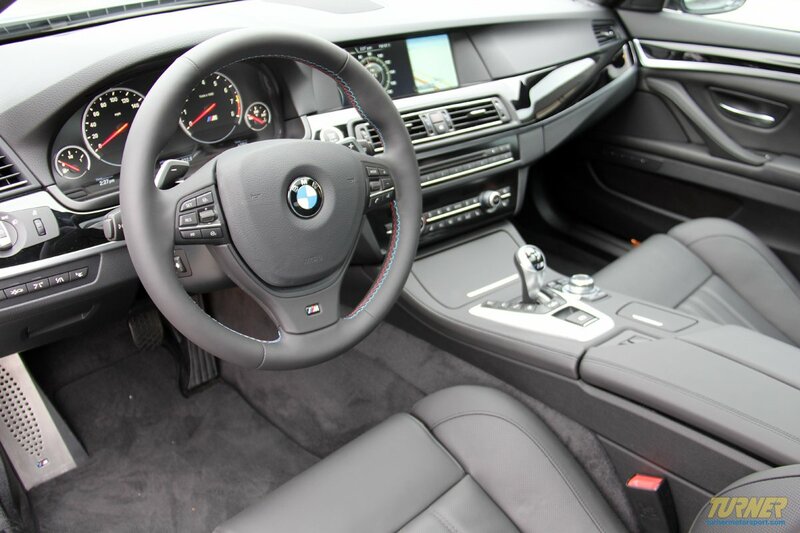 The comfort of the ride is virtually unchanged, especially when the EDC is set to comfort mode. You begin to feel the difference when you put the car into sport and it stiffens the dampening. The car is a bit stiffer going over certain bumps and changes in the roadway surface but they are very minor. The body roll is significantly decreased and acceleration and braking feel better. Before you could feel the rear of the car hunch down when on wide open throttle and you could feel the nose drop when threshold braking. Those symptoms of the stock springs seem to be minimized with these H&R springs which makes the car a lot more fun to drive. The steering also feels a bit sharper in all steering modes while still tracking down the road as the stock set up did. 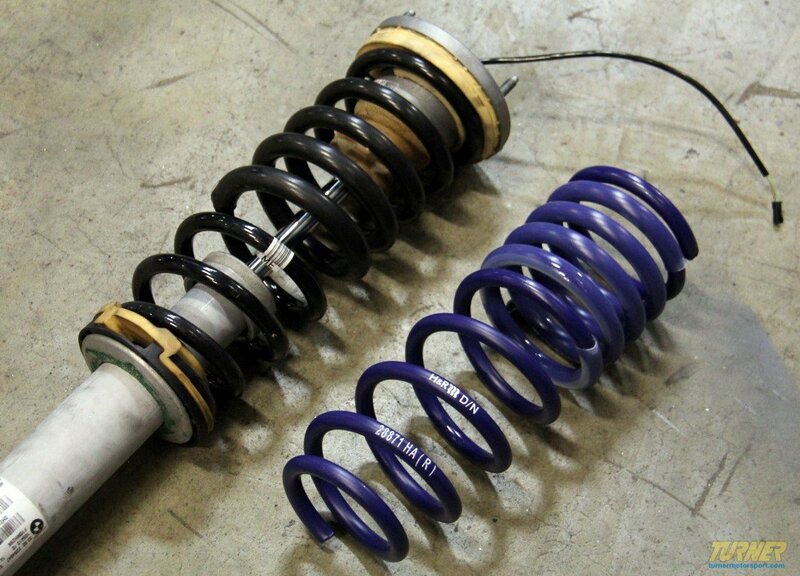 Overall we feel these springs are a great fit for any M5, there is very little compromise in stock ride comfort for less body roll and sharper handling. 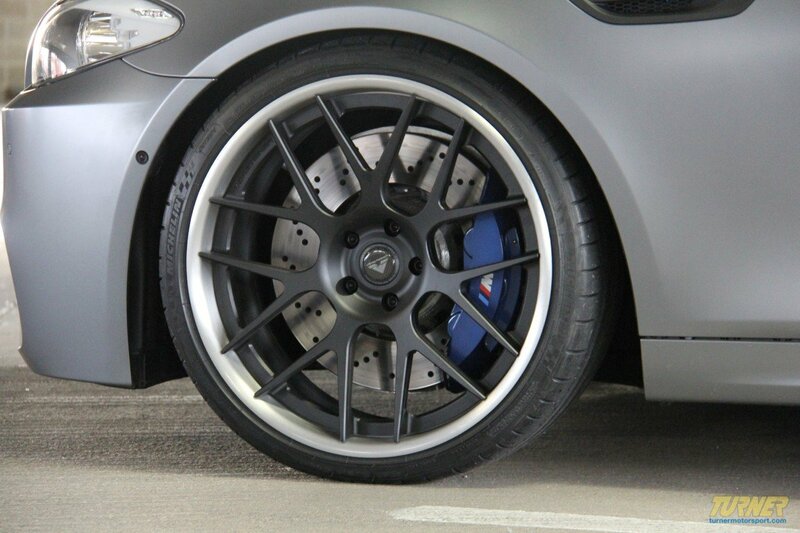 These springs are very well matched to the F10 M5 so if you are looking for a relatively inexpensive but significant improvement in your M5s stance and handling you cannot go wrong with H&R. 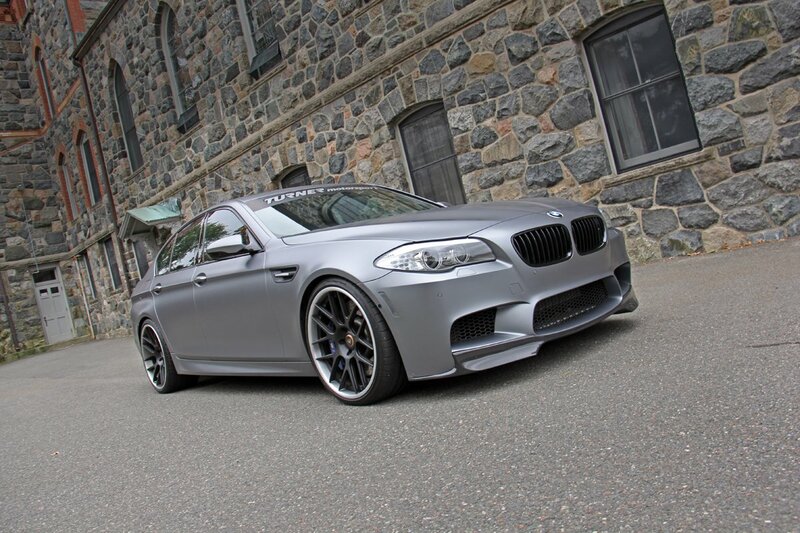 We are extremely happy with the look and fitment of these Vorsteiner wheels on our M5. The quality and attention to detail of these wheels is superb. Pairing these wheels with the H&R sport springs really gives the car an aggressive stance and look while retaining much of the stock ride comfort and feel. The fitment could not be better, no rubbing issues in either the front or rear which is great. 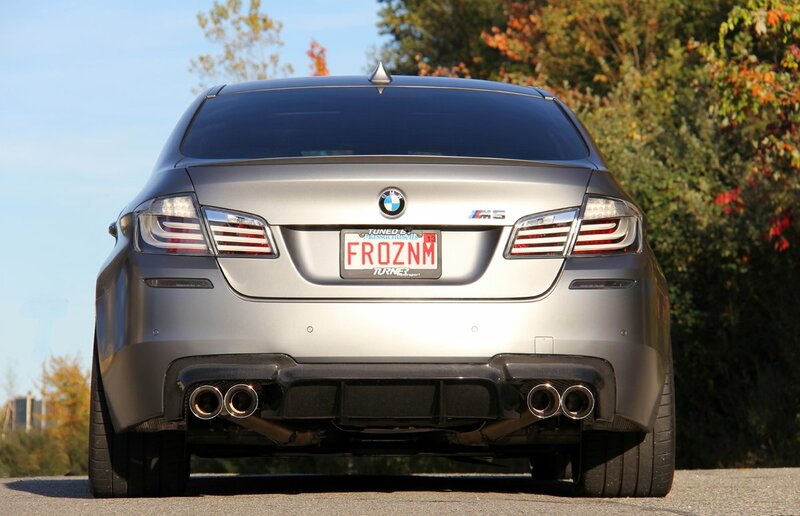 Our Race Inspired exhaust deletes the rear mufflers in the F10 M5 to allow more of the exhaust sound to be heard. 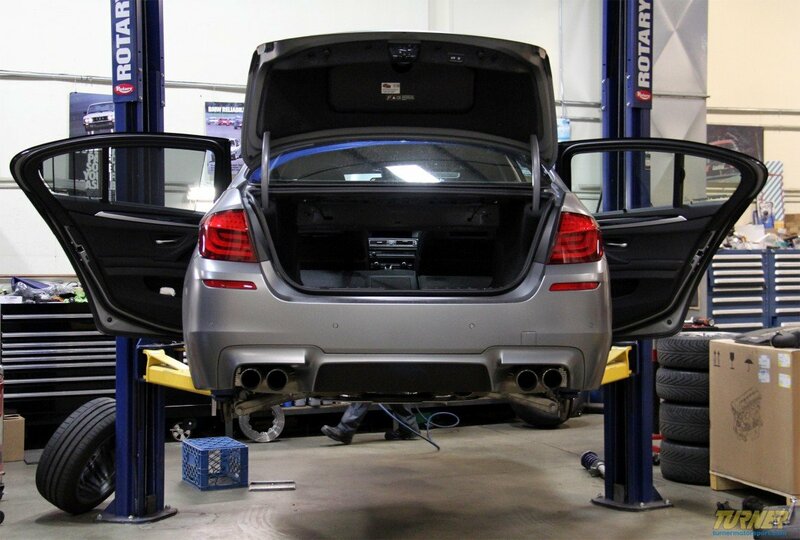 We love our M5 but it's just too quiet so we looked at ways to get more of the stock exhaust to be heard. After evaluating the stock exhaust layout it was easy to see that removing the rear mufflers would accomplish what we wanted. But cutting the mufflers off is just the beginning. We then had to develop a set of pipes and design a set of tips that fit perfectly and also looked right at home on the M5 super sedan. And these M5 muffler delete pipes are the finished product. 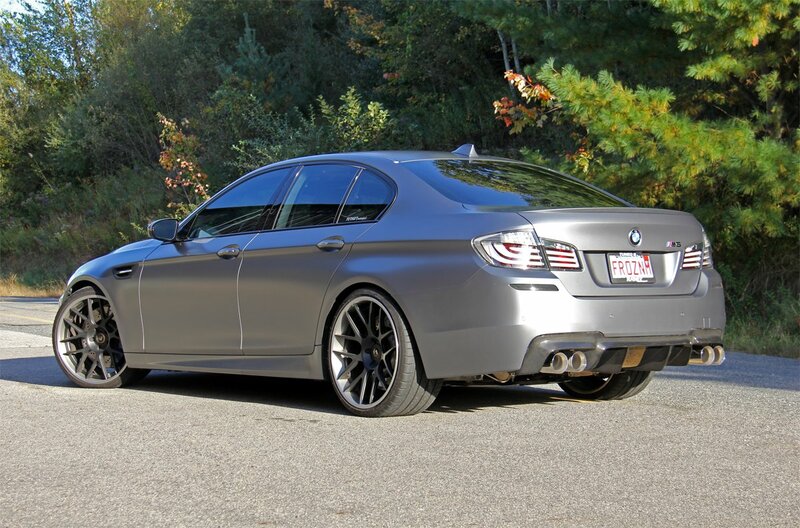 We are happy to announce that the Turner Race Inspired Axle Back exhaust system for the F10 M5 is now available with straight cut 102mm tips in both black and polished finishes. 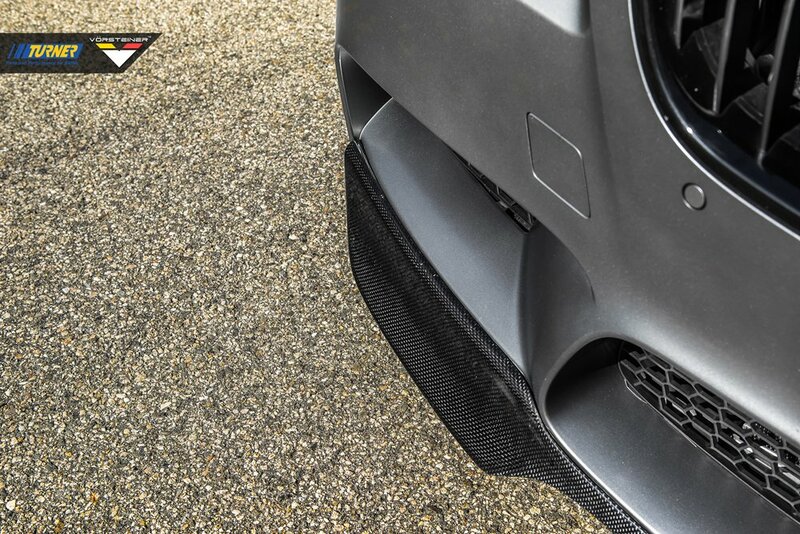 In addition to this new exhaust option that we feel looks incredible on the M5, Vorsteiner offers a front carbon fiber spoiler, rear diffuser and rear trunk lid spoiler for the M5. The front lip spoiler and rear diffuser look great on the car and help enhance the performance character of this unassuming super sedan. The Vorsteiner Carbon Fiber Front Spoiler, together with the corresponding Carbon Fiber Rear Diffuser and VS-340 Wheels really bring our Project Frozen Gray F10 M5 to another level. They add an extra layer of class and aggressiveness to our super sedan, all without making the exterior too busy or over-modified. 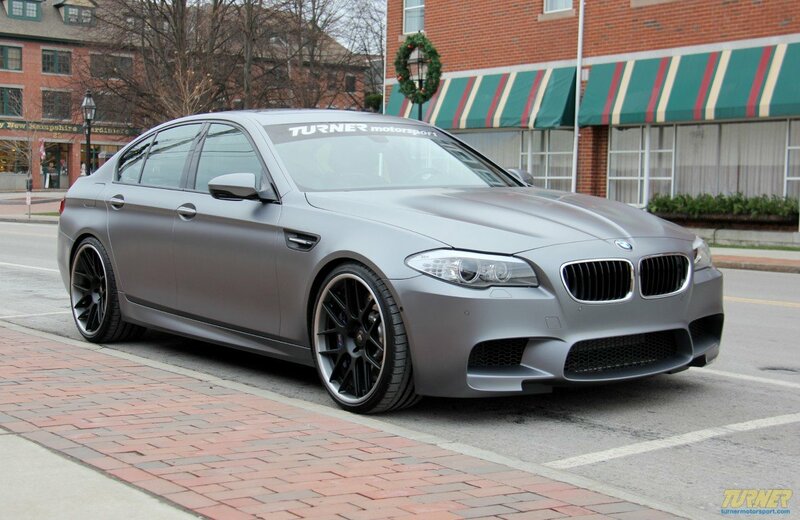 Vorsteiner's Autoclaved Pre-Preg Carbon Fiber gives amazing contrast to the BMW Individual Frozen Gray paint. 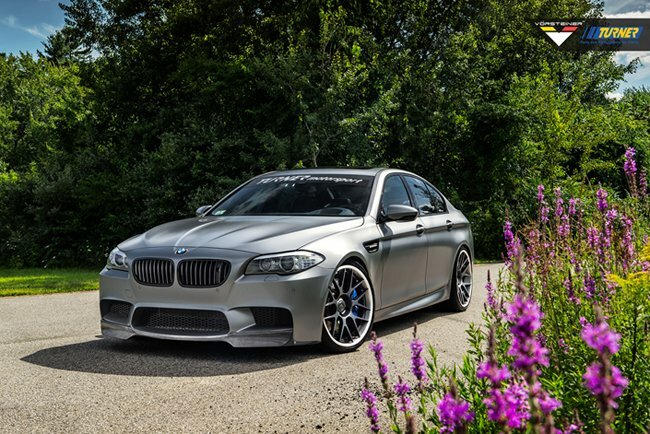 Enjoy these high-quality photographs from Vorsteiner, featuring the Turner Project F10 M5. 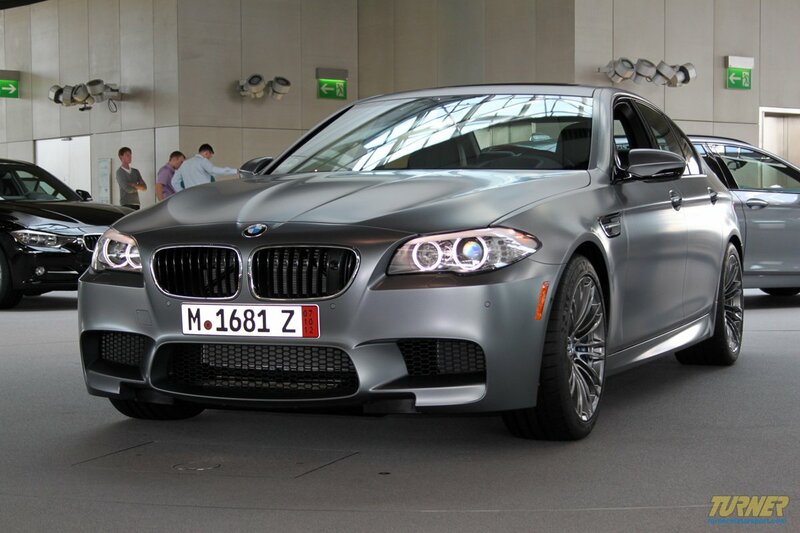 The only chrome on your M5 is the front and side grills. Black out the chrome with these! These matte black grills are a direct replacement to the standard grills, these are easy to install and a great improvement over the stock chrome grills. Made from impact resistant long life ABS polymer, these grills are precision crafted for a perfect OEM fit. Unlike some competitors blacked-out grills which have a shiny finish that give off a cheap look and feel, these black grills feature a high quality matte finish reminiscent of genuine BMW parts. 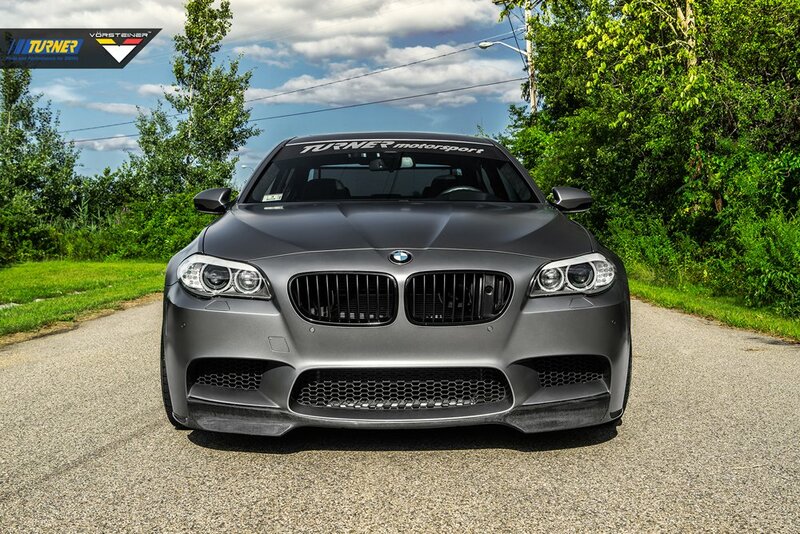 Show off the racing heritage of your F10 M5 with this Vorsteiner VRS carbon fiber front add-on spoiler! This lip spoiler mounts to the bottom of your existing factory front bumper to provide a lower and more aggressive look. For more information: Call 800-280-6966 or email info@turnermotorsport.com. 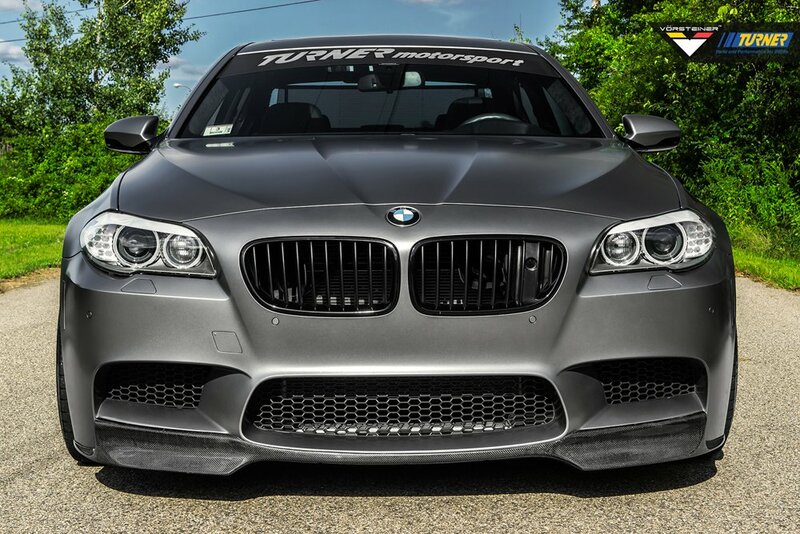 This Vorsteiner rear carbon fiber diffuser for the F10 M5 is a great addition to the look of the car. This diffuser combined with our Turner Race Inspired Exhaust with 102mm straight cut tips looks amazing. It truly transforms the look of the car. 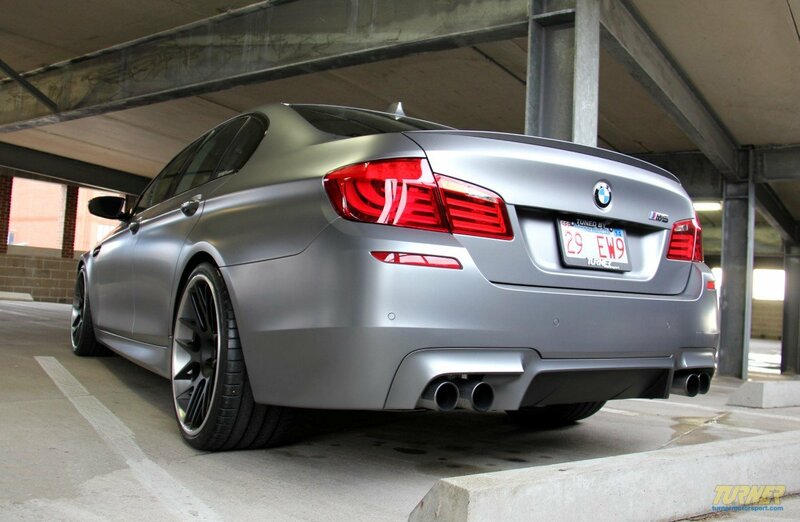 The Vorsteiner Carbon Fiber rear deck spoiler is a great addition to any F10 M5 enhancing the lines of the car. This piece is extremely easy to install and fits great. This Genuine BMW F10 white line tail light retrofit kit have a dramatic white look, and give your 2011+ 5 series sedan a very clean look, setting it apart from other F10's. These are Genuine BMW, so you know they are the highest quality. This is a 4 piece kit, which includes the two outer tail light lamps and the 2 inner parts which mount to the trunk lid. Our axle-back exhaust is made from a 304 stainless steel tube in the same diameter as the stock exhaust and with mandrel bends for unimpeded flow. It fits with the stock hangers and is clamped to the stock exhaust pipes once the mufflers are cut off. And the entire installation can be done in about an hour with the exhaust on the car. With factory clamps, you can easily reinstall your stock mufflers at any time. 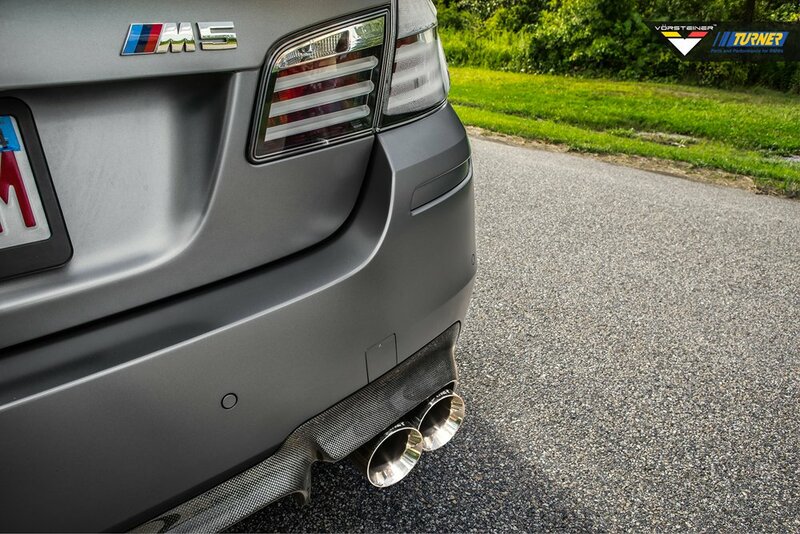 The Supersprint performance mufflers will add a little more sizzle and punch to the sound of your F10 M5. These are a stainless free-flowing muffler set that slips on in place of the factory mufflers. They have been tuned by Supersprint to add a bit more sporty and ripping sound, especially at idle, by opening up the passageways in the mufflers and doing away with the vacuum operated flapper valves. These Supersprint mufflers are tuned for street use - they let you know the exhaust is there but stay civilized and composed enough for every day driving. If you've been let down by the M5's muted exhaust growl these will be a great addition! 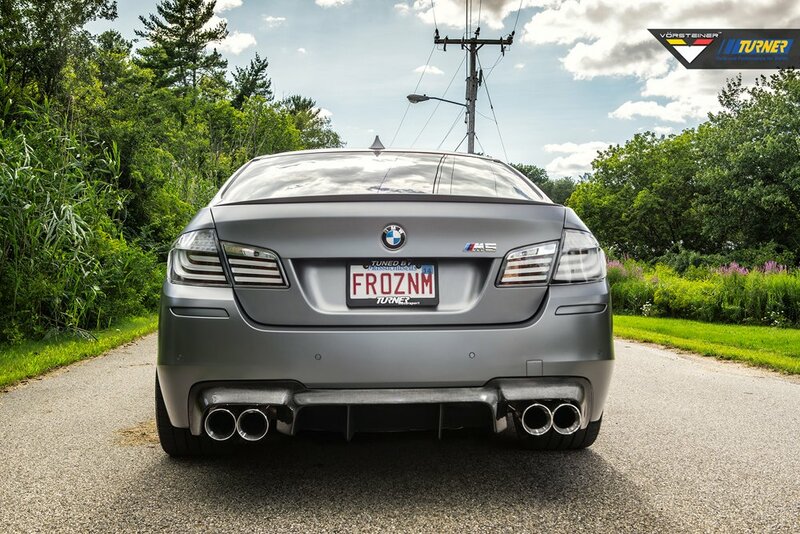 The F10 M5 is one of the most impressive road cars ever created and the Akrapovic Evolution exhaust is the perfect enhancement. The new M TwinPower Turbo M5 has been a welcome challenge to the Akrapovič R&D department, which is responsible for developing truly amazing exhaust system that offer more power, weighs less, and have an EC type-approval stamp at the same time. 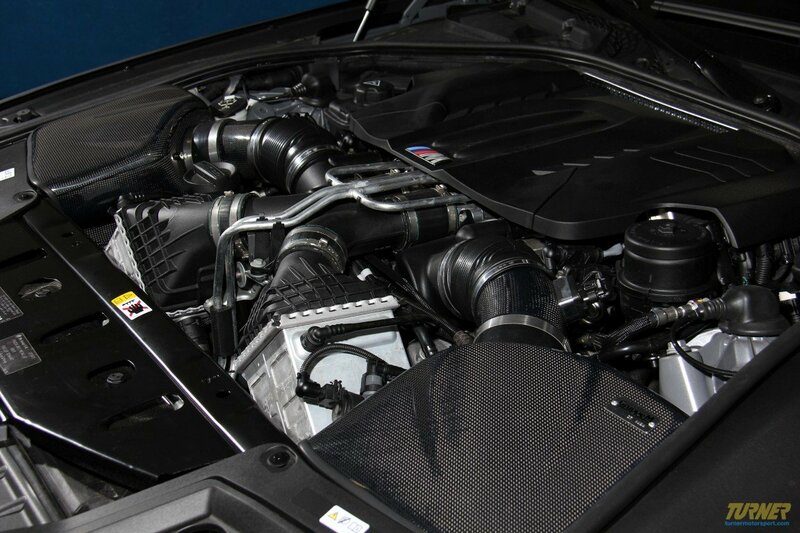 On the GruppeM intake for the BMW M5 the factory ductwork and airboxes are replaced with heat-shielding carbon fiber with enhanced inlets to capture the maximum amount of air. Lower intake air temperatures carry higher concentrations of oxygen, allowing for more energetic explosions and producing more horsepower and torque. 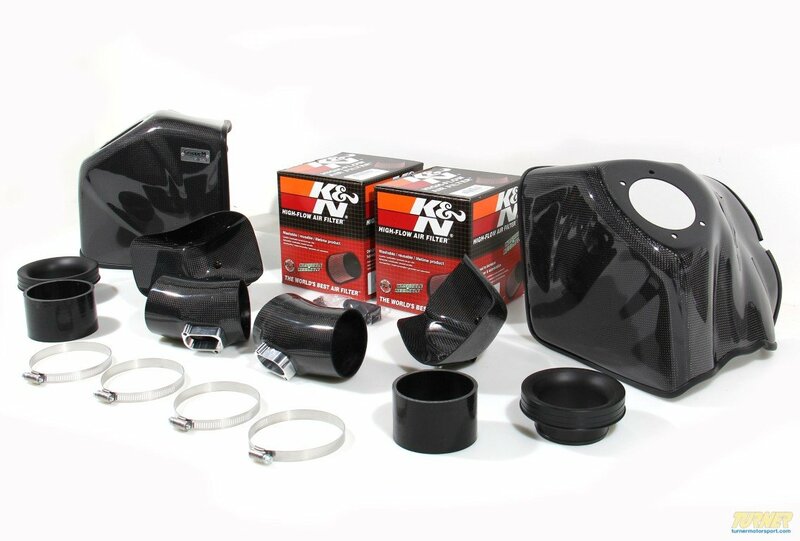 Of course, reliability is never sacrificed -- high-efficiency, high-flow K&N air filter materials prevent contaminants from interfering with proper engine function. 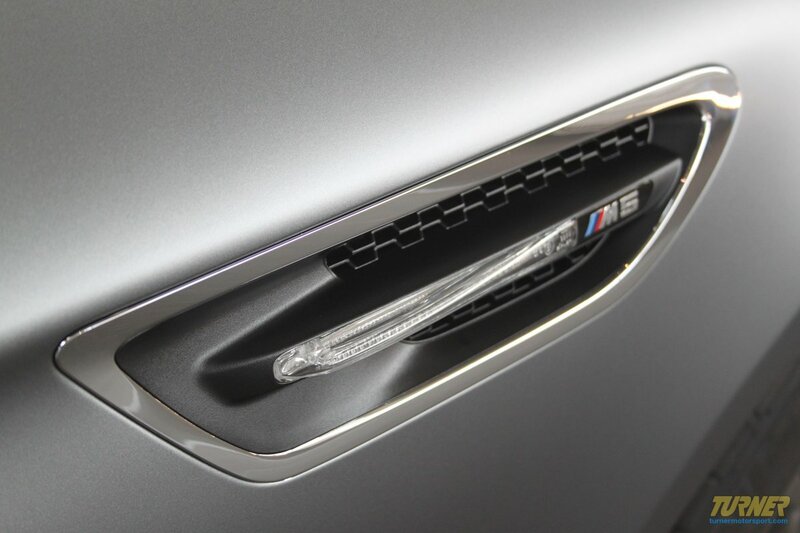 Introducing the all new afe Momentum sealed intake system for the F10 M5. This all new Momentum intake system produced up to 28hp and 31lbs. x ft. torque and outflows the factory intake by 29%. This highly engineered intake system uses twin black rotomolded airboxes that keeps warm engine air out for maximum performance. The housing use a unique Patent Pending filter to housing interface that enables us to use the largest filters possible while maintaining a simple hassle-free installation. The C.A.D. designed intake tubes are engineered to unleash all available horsepower and to fit perfectly. The kit comes complete will all necessary hardware. 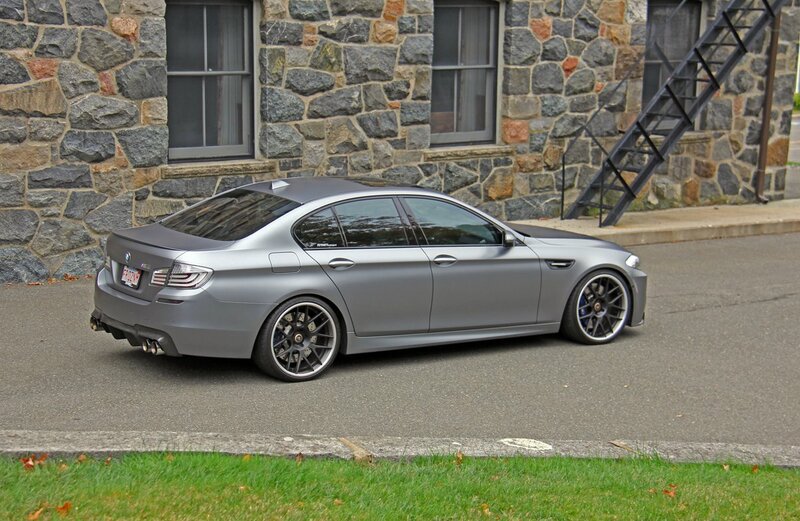 Looking to put some style under the hood of your BMW M5, M6 or M6 Gran Coupe? aFe's hand-crafted, carbon fiber engine cover will set you apart from the rest. 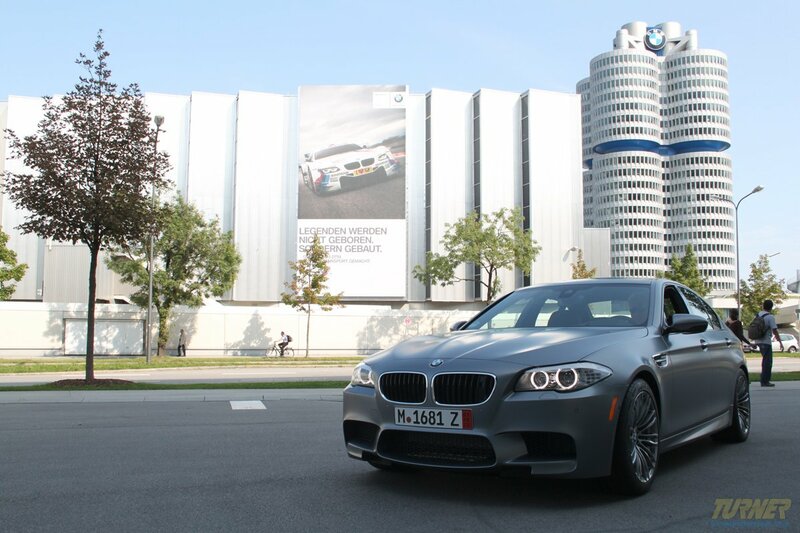 It is no shock that this race-inspired material is a favorite of BMW drivers from around the world. This cover features 2x2 twill weave carbon fiber and is finished with a high gloss clear coat, while the underside has been smoothed to insure a high-quality all around finish. Your stock 'M" emblem and rubber grommets are easily removed from the factory cover and re-installed onto the aFe carbon fiber cover. Twin 7 Spoke Race Inspired Design with satin black finish center and brushed aluminum lip. Bolted 3-piece assembly for elegant & sporty final appearance available with Factory Tire Pressure Monitoring System (TPMS). Aftermarket big brake clearances ready to be built out of box. Utilizes the highest quality forged T6-6061 aircraft aluminum materials and rigorously tested to exceed safety standards.